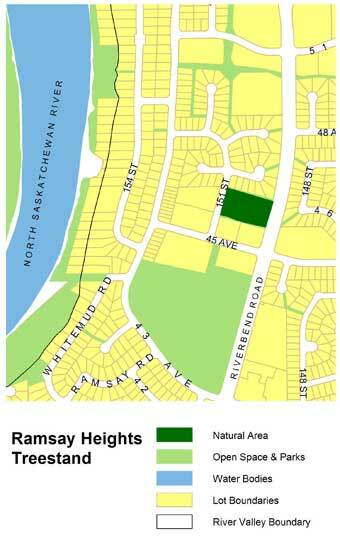 The Ramsay Heights Treestand is a small remnant patch of mixed-wood tableland forest situated between 151 Street and Riverbend Road. Although this stand is relatively small, it provides stepping stone habitat for many birds, small mammals, and insects as it is located in close proximity to the North Saskatchewan River valley. The interior of the stand can be viewed by accessing unimproved trails at the north and west side of the natural area. 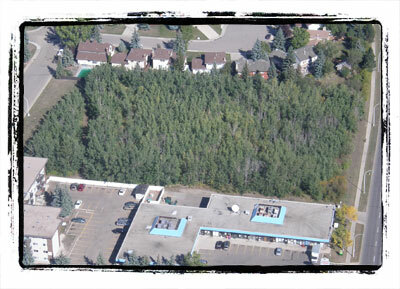 The treestand is located east of the North Saskatchewan River Valley and west of Riverbend Rd. There is parking available on the 151 St., and the natural area may be accessed either from the east or the west. An informal trail that enters the natural area from its northwest corner, and a sidewalk parallels the natural area along its eastern edge (adjacent to Riverbend Rd.). The Ramsay Heights Treestand provides habitat for a variety of bird and small mammal species. But because of the small size of this site, the diversity is expected to be somewhat less than the larger tableland natural areas. However, this treestand is quite close to the North Saskatchewan River and some species that utilize the river valley may also use this area as temporary habitat.